Who have you decided to name as your Successor Trustee? Will they know what to do? Your trust document can be complex with detailed instructions. You may want certain decisions to be at the discretion of an experienced trustee. 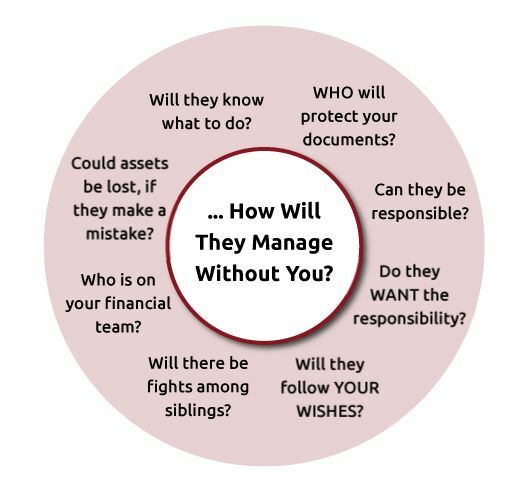 WHO will protect your documents? Your trustee will have an understanding of your plans and desires, and have a safe place to keep your documents. Could assets be lost, if they make a mistake? Some investments can lose value if unsupervised. Some of the institutions, in which you are invested, need to be reviewed regularly. Some decisions can have severe tax consequences. Precious family heirlooms need to be identified and protected for the future. An experienced team, sworn to a code of ethics, can provide asset protection and good planning for the long term benefit of the family. Who is on your financial team? The team needed for a good Estate Plan includes the professionals you already know and trust. Your trustee should have a list of all the current members of our team, like your attorney, CPA and financial planner, along with any relevant documents. The professional trustee develops relationships with additional professionals as needed. Consistent, calm communication and integrity keep the intent of the trust protected. Your trustee keeps you informed and implements YOUR decisions. Will there be fights among siblings? Trust documents and Health Care directives can protect you, your spouse and loved ones from disagreements and conflicts of interest. Making decisions NOW can bring peace and family harmony. Will they follow YOUR WISHES? Objectivity and ability to follow the trust document instructions will mean less court involvement, lower costs and fewer unresolved disputes between your beneficiaries. With an experienced trustee to take care of your daily worries, you can enjoy a greater quality of life. The trustee applies certain basic skills and knowledge; financial, legal, medical, trust accounting principles, a fair and objective point of view, knowledge of the probate code and tax laws, accurate and complete documentation, and time to do the work. Objective communication with every person involved with the trust is critical to success. Do they WANT the responsibility? At any time you choose, your Trustee can take over your bill paying, arrange for additional help for you, and look after other responsibilities you designate. Trust administration can be time consuming and fraught with difficulties. Financial transactions must be handled in a timely fashion. Beneficiaries must be kept informed to reduce fear and conflict. Decisions must be made and thoroughly documented (for as long as three years) after a loved one’s death.